On Jan. 14, 2018, Alice Rossiter Lewis, Pennsylvania, had the opportunity of a lifetime. 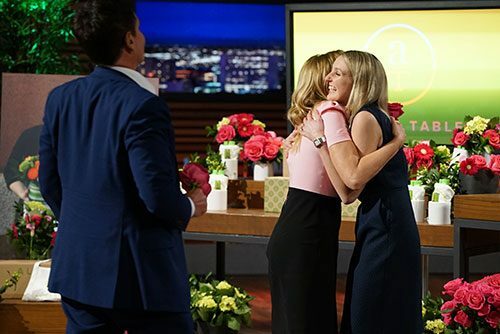 She pitched her business, Alice’s Table, on ABC’s “Shark Tank” to five successful entrepreneurs and potential investors: Mark Cuban, Daymond John, Kevin O’Leary, Lori Greiner, and Tri Delta alumna Sara Blakely, Florida State. The concept of Alice’s Table is simple: It provides women (event execs) with all the tools and knowledge they need to set up and host their own flower arranging classes, giving budding entrepreneurs the avenue to be their own boss. It should come as no surprise that Alice decided to start a business that would support other entrepreneurs – both of her parents are entrepreneurs, so it seemed a natural fit. With a background in art, Alice initially started her career in a tech start-up. But when the idea for her business hit her, Alice knew it was too good an opportunity to pass up. Alice’s Table provides all the training, supplies and in-house support for their event execs, so they can focus their creative energy on hosting their flower arranging classes. The classes themselves are a fun way for attendees to meet people, learn a new skill and create their own beautiful flower arrangement that they can then take home. These events can range from charity fundraisers, bridal showers, birthday parties, a girls’ night out, or anything else you can dream up. “The best part of our events is that they’re always different,” says Alice. In addition, a staple of Alice’s Table is the sense of community it creates for women —it’s something that’s very important for Alice. Currently, more than 200 women have started their businesses with Alice’s Table across the U.S., and by the end of her “Shark Tank” appearance on Jan. 14, Alice had brought both Mark Cuban and her own Tri Delta sister and SPANX creator Sara Blakely on board as investors. The success from “Shark Tank” has shone the spotlight on Alice’s Table in other ways. In February, Alice made a guest appearance on “Live with Kelly and Ryan” where she demonstrated flower arranging, and Good Housekeeping named Alice’s Table the number one experience to gift. But even amidst her current success, Alice is already looking for ways to expand her business model.